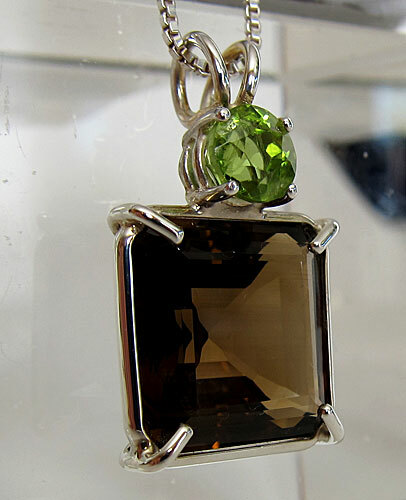 Dimensions (HxWxD): 1" x 0.65" x 0.25"
This beautiful gemmy water-clear Smoky Citrine Earth Heart Crystal Pendant in sterling silver is topped off with a sparkling round Peridot gemstone and comes with a sterling silver chain in its own velvet jewel box. 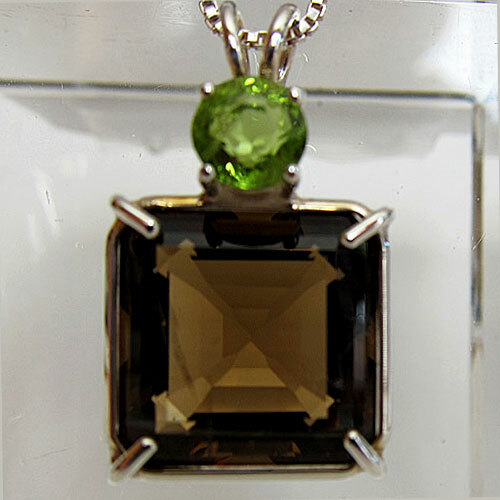 The combination of smoky citrine and peridot energizes the solar plexus chakra, the heart chakra, and the crown chakra simultaneously, strengthening the will forces, opening the heart and connecting the bearer to Spirit. Smoky Citrine combines the energies of these two powerful types of crystal. Smoky quartz and citrine are both found in high-temperature hydrothermal veins on Brazil, and both are used to transform negative or unwanted energies. Citrine is a form of quartz occurring in a variety of colors ranging from platinum white to yellow to orange-red. Citrine's color is a result of iron impurities occurring naturally within the crystal. Citrine typically is formed as an iron-containing amethyst which becomes heated to the point where the iron held within the crystal undergoes a further stage of oxidation. Note: Weight above is shipping weight. Net Weight is .20 oz.